Dealing with the many causes of this common pool problem. Common Causes of Cloudy Pool Water and Effective Solutions..
Scroll down to browse through some archived SWIMMING POOL questions and answers. Please click the Pool Problems Link, on top of every page, to access a complete listing of Pool Problem subjects, an alphabetized Website Table of Contents, Pool Equipment Information, About Alan Biographic Material and a Pool Glossary. Use the other links to access additional subject information. More information about some new and unique products, for pools and spas, can be found by visiting The Website Stores. You'll never know what you'll find and that's always fun. Be better prepared and avoid costly problems! A clearly better way to improve pool water clarity!!! The Nano-Technology Pool and Spa Clarifier Sticks are a revolutionary way to improve pool and spa water clarity, while eliminating all types or organic contamination and lasting 4-6 months. No Installation is required. Simply hang the Nano-Stick, in the pool or spa. Can be used with all types of pool and spa sanitizers. Uses only the power of light, to destroy organic contamination. Clearly better! Available in pool and spa sizes. Clarifiers for Pools and Spas. Why settle for 20th century results, when you can have all the benefits of a 21st century revolution in pool water clarity? Light activates the Nano-Titanium and organic contamination is destroyed, while pool water clarity and quality improves. A ColorQ, all digital Water Tester can perform all of the common tests, while eliminating the color-matching and guesswork. With 10 models, performing up to 11 different test factors, one is right for every need. The Nano-Stick Clarifiers are a 21st Century way to improve water quality and clarity. The Circulator is a replacement return jet fitting, that dramatically improves circulation, by creating a spiral return flow. Better circulation helps sanitizers work more effectively. How to keep your pool water crystal-clear? Cloudiness is one of the most frequent pool water quality problems that may be encountered. There is no one cause of cloudy, dirty, hazy, murky, gray, milky, muddy or dull pool water problems: suspended insoluble particles, dead algae, organic debris, poor or inadequate filtration, inadequate sanitation, poor water chemistry, poor source water quality, vandalism and more, all have to be factored into the treatment of this problem. Cloudy pool water conditions, associated with green or brown colors, may be the result of algae and/or mineral problems. Foamy water conditions, resulting from the use of certain algaecides, air leaks, body oils or cosmetic residues, can detract from optimum water clarity. Most pools do maintain clear water conditions, the majority of the time. For those occasional problems, many chemical products and even some non-chemical; devices, are available, that help to restore the pool water clarity to crystal clear. The addition of a Nano-Stick Pool Clarifier, which lasts 4-6 months, and works 24/7 to oxidize fine suspended particles, that might otherwise past right through filters is an ideal way to promote better water clarity, on an ongoing basis. If problems arise, refer to the Pool Problems Page, as a source of problem-solving information, broken down into various categories. Scroll down the page and click on the linked keywords, catch phrases or images, in the archived answers below, to access additional information, on that topic or product. ► Why Is Silt Present? Help!! Our in ground gunite plaster pool. It is 9 years old. It is using the salt water system which we love. Work great water is always up to par we check it daily and then once a week take to the local pool store. The one we take the water to is a respectable pool place. But have a question for you. We will not have any one in the pool, for a week or so. Then we will get in and the is white dust thick on bottom. Not quite sure what this is. Thank you for listening please get back with us, as soon as possible with some answers for our problem. Thank you and may God Bless you for helping others, all of our level are perfect. Thank you. It is called silt and is a combination of wind-blown dust and debris and, possibly some dead algae and plaster dust. When the pool is in use, all this gets stirred up and is mostly filtered out. It doesn't have a chance to accumulate. If the pool is not used, for a week, it tends to accumulate and cloud the water after it is agitated by swimmers. Vacuuming, first thing in the AM, should help. Adding The Pool Circulators will dramatically improve circulation and help reduce the volume of sediments. Adding a Pool Nano-Stick Clarifier can help eliminate fine particles, for up to 4-6 months and it adds no chemicals, to the water. I hope that the information provided was helpful. ► Why Did The Water Suddenly Start To Get Cloudy? Alan, I emailed you a few years back for a problem and you helped me and solved my problem. So I am coming to "The man" again. I have an inground Grecian shaped pool with 19,000 gallons of water. I am using a sand filter and 3" round pucks for a sanitizer. The pool is approximately 15 years old and had a new liner put in 2 years ago. It was filled with city water that was trucked in, as I am on well water. I very rarely have to top off with well water, as it has been raining. I have not had any problems with the pool in years, until now. So here's the issue: The pool was crystal clear. Then, on Friday (3 days ago) there were approximately 12 people swimming in my pool for a few hours. Saturday morning, pool crystal clear, a few kids swimming during the day. Sunday morning at 10:30 am, crystal clear, pH 7.1 and chlorine at 1.5 ppm, I brushed a few leaves and bugs into the bottom drain. Then after work at approximately 2:30 am on Sunday, I checked the pool and it was so cloudy I could not see the bottom. So approximately 14 hours later, it clouded up bad. I run the pump 24 hours a day and the pressure is at 13-15 PSI. I shocked the pool and checked later in the day, same thing. The PH level went down to 6.8 so I added some PH rise to 7.2 and chorine was off the charts because of the shock. Now Tuesday morning, still cloudy, I don't know what to do and I don't want to buy 100's of dollars' worth of chemicals until I have an answer. Any help would be greatly appreciated. Thank You. Three chlorine tablets in the skimmer is never going to keep up with the chlorine demand created by 12 people using a pool, on a hot day. Once the free chlorine bottoms out, algae can start growing. Algae, live or dead, will result in cloudy water. In addition, a sand filter is unlikely to be able to remove the dead algae, as it can pass right through. You need to boost the free chlorine to 5-10 PPM and keep it there, until conditions improve. Pucks in a skimmer are not a good way to add chlorine. It offers no chance to quickly boost the level. Prolonged use will force you to replace water, when the CYA level reaches 150 PPM. Replacing water is a problem, when well water is involved. A better way to do chlorine is with a salt chlorine generator. You will have better control and the ability to raise or lower the free chlorine level. It eliminates the buildup problems, as well. When the free chlorine bottomed out, due to the bather load, there was no sanitizer present. If you had a solar-powered pool purifier, it would have added copper and zinc ions, to help maintain algae control. Replacing the sand with a zeolite sand replacement media will greatly improve the filter's performance and will remove dead algae and very fine debris. Zeolite is even better, when used with a salt chlorine generator, as the salt regenerates the filter media. Your filter pressures sounds a bit high and may be the result of channeling. If that is the case, this would be a good time to replace the sand ands, perhaps, change to another filter media. I hope that this recommendation works out for you. ► What Kind Of Clarifier Is Safe For The Filter Media? Occasionally, I encounter problems with cloudy water, where it seems that the filter is simply not able to remove the fine particles. Is there a clarifier that is OK to use with a D.E. filter? Thank you for providing this forum. So far as I know, all clarifiers use a polyacrylamide or polyelectrolyte, as the active ingredient. Its electrical charge causes fine particles to come together, making them larger and easier to filter out. This same action can cause the D.E. to coagulate and lose effectiveness or clog. It will also affect sand or Zeolite filter media, to some similar extent. The Nano-Stick Clarifiers are 21st Century technology, that do not interfere with any filter media. It uses Nano-Titanium Technology to oxidize and destroy fine particles, as they flow into the clarifier stick. It releases no chemicals and, therefore, is 100% safe for use with all types of filters and pool chemicals. It works 24/7 and lasts as long as 4-6 months and is a clearly better approach, to solving pool clarity problems. All you need do is hang it in the pool, from a ladder or rail. Installation is that simple. I hope that this revelation will prove helpful. ► Can't Clear It Up, With A Sand Filter? I can't seem to get my problems resolved at my pool store so here goes. After opening up the pool the water was green and some brown yuk in it falling in from the cover. The filter going, shocked it, got it all in balance but was still green after running pump continuously. I took a sample in to be tested, it's balanced but still green. They gave me black algae stuff told me to pour it all around the pool, brown stuff should come to the top, vacuum, backwash and shock. The brown stuff never happened, I did the rest, still green, no green stuff comes out in the backwash either. I took another sample in yesterday, my free chlorine is 10, everything else in balance, still green and cloudy. They sold me another bottle of black algae killer and this time told me to run some down the filter, turn it off for 2 hrs then start back up, did that, this morning, still green and cloudy. I'm starting to feel it's in the sand filter and it's not filtering properly. I have some filter cleaner stuff that goes down the skimmer, I thought I would try. If you have any suggestions, please let me know. This is getting expensive and frustrating. Thank you. It would be presumptuous of me to say that it is your sand filter that is at the center of the green pool water problem. But, I can think it! You seem to have added some premium algaecide and with a Free Chlorine level that high, algae should not be a problem. So let's concentrate on the likely cause: the filter! Sand filters can become channeled. In essence, that means the water is not being filtered, but is merely being recirculated. If the pressure of the filter is not rising over time, that could be a sign of a channeled filter bed. Sand filters should not be backwashed frequently: usually only when the pressure is too high. If the sand in the filter has not been changed in recent memory, it might be a good idea to start there. Today, there is filter media that can be used instead of sand. Zeolite is a natural mineral product, that replaces sand and can greatly improve the water clarity and quality. Liquid clarifiers can help clear up cloudy water. However, are temporary and can cause the filtration media to coagulate. Nano-Stick Clarifiers add no chemicals to the water. They are simple hung in a pool, usually from a ladder, and can last 4-6 months, while they oxidize and destroy fine particulates. ► Poor Circulation Causing Problems? Alan, I have a triangular shaped inground pool ( right Triangle) medium size (c 8000 gals) with two returns. One is placed directly across from the skimmer entrance at the small side of the triangle. I need to improve the flow of water around the pool. Are there extenders available for the returns to help? Any other suggestions? Thank You. That type of shape probably promote dead spots and that leads to safe harbors for algae. Poor circulation can be part of many problems and The Pool Circulator can be the solution. It is a simple to install device that makes a dramatic difference in the water circulation. This unique, sensibly-priced product, turns the return flow into a spiraling flow and that eliminates the dead zones. Adding a Solar-Powered Robotic Pool Surface Skimmer will improves circulation and remove floating debris, as it wanders the pool, all on its own. One or both products should make a dramatic improvement in circulation, chemical and heat distribution and improve clarity. I hope that this information will help solve the problems. How to Prevent and Treat Cloudy Pool Water Problems. Use a salt Chlorine Generator for better control, with fewer chemical byproducts. Add a second layer of back-up sanitation, for reduced chlorine consumption. 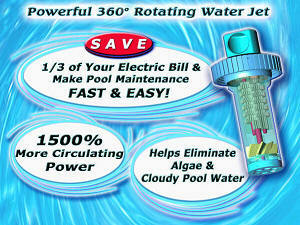 The Pool Circulator improves circulation and eliminates dead zones, that promote algae growth. A Solar-Powered, Robotic Pool Skimmer removes floating debris and aids in water clarity. Better chemistry helps promotes sanitizer effectiveness, reducing chemical usage. Dual-Ion Purifier, uses copper/zinc ions. For all pools. The Pool Circulator eliminates dead zones and improves sanitizing action. This Solar-Powered Pool Skimmer removes debris, before it sinks to the floor. Use a 21st Century approach to water clarity, with new Nano-Technology. ► Better Circulation Means Better Results? I am considering ordering The Circulator return nozzle circulation booster. My question is does it really make a difference? I will say that we just painted our pool with Ultra Poly One Coat and it looks great. Hope it holds up as long as they say it will. Thanks. The Circulator really makes a positive difference. The water just doesn't simply go straight ahead, it spirals ahead and down, for more complete circulation. This aids in water clarity, heat distribution and sanitizing. No more dead spots. And it couldn't be easier to install. Glad to hear about the painting going so well. I have no doubt that the Ultra Poly One Coat will provide years of excellent service, as I have only heard good things about the product. Enjoy the summer. We have a soft-sided, vinyl pool that holds about 4000 gallons. Every time the kids jump in, the pool clouds up. My free and total chlorine and pH are good. When I rinse the filter out it washes out sort of dirt. I think the problem is sediments on the bottom, which cause cloudy water when disturbed. The filter doesn't seem to help with the sediment and my vacuum (garden hose type) is useless, for anything but leaves. Got a good suggestion or two? You have a filter that is barely effective. When the kids use the pool, they stir up silt that has accumulated on the bottom. The filter can remove only what enters the system. By adding The Circulator, a circulation boosting accessory, you can get more of the silt removed and the water will steadily improve. The Circulator was originally designed for inground and standard above ground pools. However, now there is an adaptor that allows it to be used with soft-sided pools, from the leading manufacturer. Adding a weekly dose of a Blue Clarifier, should help, as well. Even better than a liquid clarifier would be a Nano-Stick Clarifier, which remains in the pool and works for 4-6 months. It works 24/7 using new technology, requires no installation and is compatible with all sanitizers. I have been told that The Circulator can make a huge improvement in water quality, in pools like yours, in particular. I hope that this information will prove helpful. ► How Does A Nano-Stick Clarifier Work? I have noticed, in several of the replies, that you suggest using a Nano-Stick Clarifier, to improve water quality. How does this work? Thank you. Fair question!!! The product was developed by one of the leading producers of filtration equipment, for a host of industries. They have a 60,000 square foot research and production center and this product came out of that environment. It is based on Nano-Titanium, in a ceramic form, and in that manner it can cause major improvements in water clarity and quality. The pool and spa industry is only a small segment of their overall business. To learn more about the products go to: Nano-Technology for Pools and Spas. This is not your father's clarifier - this is 21st Century. I hope that you will find this material interesting. ► D.E. In The Pool? I just got a new pool liner installed, filled it up over night and when I setup my DE filter and added the DE it got cloudy. I've added my shock, as I usually do, as well as the proper amount of DE. I've done nothing different this year, then the last 6 seasons. Why is my water cloudy? Could the DE have been pushed into the pool, bypassing the filter into the pool? Or is it just that the filter must run for a while to do its job? The evidence seems to point to D.E. getting into the pool. The cause is probably mechanical: something broken or not put together properly. You might have to take the filter apart. Try using a dose of a quality "Blue" Clarifier to help remove the D.E. from the pool water. Even better, for the long haul, would be a Nano-Stick Clarifier, which will not interfere with the D.E. Filter and can last for 3-4 months. THE NANO-STICK CAN LAST 3-4 MONTHS. I hope that I have been helpful. Enjoy the season. I am in the middle of a battle against algae. Happily, I am winning. I had to add a lot of shock - the 1 pound bags of calcium hypochlorite. As the algae is being killed off, the water now seems to be cloudy. What should I do to keep everything on track? Thanks a lot. Sincerely. You might have two causes for the cloudy, hazy pool water problem. One obvious reason is that as you are killing this algae, you are leaving behind dead algae and organic debris. This can be dealt with very effectively, with the addition of a dose of a Nano-Stick Clarifier: a 21st Century product that can last up to 4-6 months. A robotic pool cleaner would be a big help in removing the fine particles that settle to the bottom. In addition, the use of a robotic pool cleaner will improve the circulation on the bottom and in the corners, making algae control easier. The shock that you are using tends to raise the pH and contains calcium. TEST THE WATER FOR pH, TOTAL ALKALINITY, AND CALCIUM HARDNESS. You might find that your pH and TA are too high. These factors can compound any potential calcium problem. If the calcium level is too high, add a quality Mineral Treatment to help deal with that factor. You really didn't provide many details. It is possible that your filter is not working properly or that the cycle is not long enough. You might want to browse through the archives on those topics. I hope that I have been helpful. ► Hazy And Cloudy Water? I need your expertise again. Opening my pool for summer (Orlando area) pool store said I needed 40# salt, did that. 1 gal acid, did that. 2-1# bags of shock, did that. Cleaned my cartridge type filter (100sq ft) I did all this 2 days ago, and now my pool water is hazy/cloudy. It was actually clear before all this. Test strips show everything good. Any ideas? Thanks. You just opened the pool and it would not be uncommon for the walls to have had algae growing on them. The boosting the chlorine could have killed this algae growth and resulted in cloudy water. You might require a new filter cartridge. Buy another and alternate, while it is being cleaned. Want easier cleaning? An Automatic Filter Cartridge Cleaner is available. Find it in the website store. In addition, you could add a Nano-Stick Clarifier, which provides clarifying action, using new Nano-Technology, for up to 4-6 months. I hope this information proves helpful. ► Milky White Swimming Pool Water? Hello, I'll try to make this quick cause I know you get tons of e mail. I have an above ground 18', vinyl liner. I had the water tested by a pool place, did exactly as their results instructed me to, which was to add about 5 lbs of pH plus. Alkalinity, pH and free chlorine levels are now good, but the water has remained VERY cloudy, not green cloudy but white and milky. This is bad pool water! I have cleaned out the cartridge several times, the milky water will not clear up. Thanks. A little more information would have allowed me to focus directly on the possibilities. Adding all that pH increaser must have been necessary because the pH and TA were very low. At low pH readings, minerals such as calcium are more soluble. It is pr obable that your milky, white pool water is due to calcium precipitating out of solution, as the pH and TA were raised from their low points. If your calcium hardness reading is above 400 PPM, this is a very likely possibility. This sounds like a pool opening and, therefore, algae could have been a problem. Dead algae can pass right through some filters, especially sand filters that have become channeled. I suggest that you add a quality clarifier, such as the Nano-Stick. This utilizes new Nano-Technology, in place of chemicals to achieve a high degree of clarity. This type of product can oxidize and destroy dead algae and debris, as water passes through the Nano-Stick. If you have a sand filter, I suggest that you consider using a zeolite sand replacement filter media, in place of ordinary filter sand and reap the benefits of much more efficient filtering, as well cost and chemical savings. With the pool water chemistry in balance, improving the filter efficiency seems to be the necessary course of action - whether the problem is due to calcium or dead algae. I hope that the information will prove helpful. I have an 18' x 42" above ground vinyl pool with the thru-the-wall cartridge filter. I've added chlorine, shock, alkalinity, pH, algaecide and stabilizer. I've vacuumed the pool and changed the filter. The chemicals are at their proper levels, but despite all this, the water is still cloudy. This has been going on for 4 weeks now. Is it safe to let my kids swim in cloudy water? What else can I do about the cloudiness problem and attain crystal-clear water. HELP! Thank you. If you are able to maintain a 1-3 PPM level of Free Chlorine, it is likely that the pool water is in acceptably sanitary condition. However, cloudy water creates a potentially dangerous situation. Suppose a swimmer was in trouble and you weren't able to see him on the bottom? It has happened: I was considered as an expert witness, in such a case. In the interest of safety, you need to get the water clear. If the chemistry is right, the problem may be that the filter is not able to remove particles, as fine as those present or that it is not being operated correctly or for long enough periods. The filter cartridge needs to be cleaned or replaced. The pressure could be too high, indicating that the water recirculation is poor. Cartridge filters should be cleaned often: weekly in most cases. THE BLASTER is an automatic filter cleaner that attaches to your garden hose and makes cartridge cleaning simple and quick. Try this. The first thing in the morning - before the pool is used - vacuum thoroughly. This will help remove silt that has settle to the bottom. Otherwise it will be stirred up by swimmers and cloud the pool water. In addition, you might add a dose of a quality "Blue" Clarifier after the vacuuming and keep the filter operating for at least 6-8 hours, after the addition. This type of product can help coagulate fine particles for easier removal. Liquid Clarifiers are short term products (days at most), while a Nano-Stick Clarifier can last as long as 4-6 months and is safe with all filters and chemicals. One factor of pool water chemistry that you did not bring up is calcium hardness. The calcium hardness can affect the clarity of the water and should be checked into. An effective way to deal with silt deposits is with the use of a robotic pool cleaner. These devices cover the whole pool and act as a second roving filter to help remove fine silty deposits. More information on this factor can be found in the archives. I hope that this information will prove helpful. PLEASE HELP ME ALAN. Love your site. I recently took on the task of cleaning and reopening my mother's pool for her. She has an aboveground 27 x 48 round pool, and when I arrived on the scene, there were endless amounts of dirt, muck and mire in the bottom of the pool, creating algae and other problems in nightmarish proportions. I think she had someone take the cover off for her, and it was either done too early in the season or leaves and detritus on the top of the cover were allowed to drop into the pool. At any rate, after numerous attempts to filter and chemically treat the problem, I convinced mother to let me drain the pool. It was drained and shop-vac'd until there was not a speck of water remaining. I hand scrubbed every inch of the liner with algaecide and cleaners, and rinsed and scrubbed and siphoned and shop vac'd until the entire thing was spotless. We're talking days and days and nights and mornings of work, all the while thinking to myself "Mom's going to have the cleanest, clearest pool in the entire state." So I got it spotless, dry, and immaculate, and spent another day and a half filling it. All was right with the world. We had the sand filter medium replaced, and once the pool was filled and the filter had run for 24 hours, you were looking at the cleanest, purest water you could ever hope for. Following the manufacturer's directions, I began adding chlorine until the level tested correctly. The next instruction was to test for pH, and it tested very low. So I added pH increaser (sodium bicarbonate) according to the package instructions (in this case, approx. 1.5 lbs for a 16k+ gallon pool). I cannot tell you the horror. The chemical spread across the pool like a low dark cloud: it was like something out of a science fiction movie. It swirled around the bottom and covered the entire pool bottom in an evil milky haze. It rose, and within 30 minutes turned the entire labor of love into a big soup of dirty, yucky, cloudy pool water. I wanted to cry. I have tried everything in the last 24 hours to correct the problem. More chlorine to no effect. I purchased clarifier and added that to the system. Again, no effect. Please tell me what I did wrong here, or what I can do to fix this. My mother's 60th birthday is only a day or two away, and I wanted nothing more than to take care of this issue for her. Any advice you could give would be truly, sincerely appreciated. Your pool problem started out as algae and lots of dirt and muck. You dealt with that! The problem that you now have may be unrelated to the original situation. Adding pH increaser (sodium carbonate-not sodium bicarbonate) increased the pH of the water. At low pH values the water can be irritating, but it can keep minerals in the water more soluble. Raising the pH likely caused some precipitation to occur. It is possible that your calcium hardness and/or total alkalinity were too high and raising the pH caused the cloudy pool water problem. Adding the chlorine, if this was the problem, accomplished nothing useful. In fact, it may have further increased the pH. You need to have the water tested for pH, TA, iron, copper and calcium hardness. You may have to add a phosphate-free mineral treatment, such as Liquid MetalTrap to deal with the heavy metals, if they are too high. After the water analysis, there will be a better understanding of the problem. Possibly, the filtration is not adequate. Make sure the filter pressure is in the recommended range. I hope that this information will prove helpful. ► Better On Other Side Of Fence? My neighbor and I both installed new above ground pools in our backyards this spring. His pool is crystal clear while mine is cloudy. I also seem to get more build up of green scummy stuff on the bottom which is very difficult to clean up! He uses chlorine, while I use bromine. Both of our pools see very hot direct sunlight (currently, my pool temperature is 85ºF). Should I switch to chlorine? You are not going to like this! Your neighbor's pool has cyanuric acid to help protect the chlorine, against the Sun's UV rays, and make it last longer. Your bromine pool cannot be protected against the Sun's UV. Cyanuric acid will not help. You must add more bromine or chlorine to maintain any given level. If you add chlorine, it will convert to bromine. The only way to avoid this is to eliminate the bromides from the water. To do that, you must drain the pool. Draining a pool is not without some risk, so I suggest that this be thought out. There are advantages to bromine, such as less odor and irritation, but you will use more chemicals. The algae problem is the proof. To help get by with less bromine, I suggest adding a Solar-Powered Dual-Ion Purifier/Mineralizer. It will help control algae, if the bromine levels falls. Otherwise, you get algae. I suggest that you add the liquid chlorine or quick dissolving shock, about a pound/gallon per 5,000 gallons, until the bromine level is over 5 PPM. Don't drag it out! The longer it takes, the more product will be required. Keep it there until the problem is under control. You have green, cloudy, murky water because the sanitizer level was inadequate and algae took hold. Check the overall water chemistry as well. Have the water tested for phosphates and nitrates, as their presence could promote algae growth and increase bromine usage. Poor circulation can make algae growth more likely. You might consider adding THE POOL CIRCULATOR. The easy to install device will eliminate the dead spots that can promote algae growth. Adding a Nano-Stick Clarifier can help destroy organic byproducts and contamination, that detract from the clarity of the water. It requires no installation and can be used with all types of sanitizers. Just hand it in the pool and it can last for 4-6 months. I hope this will help you clear things up. I have read a lot from your Q and A section on cloudy water and I think I have found the answer to my question. But, I have one more. What is the effect of water temp in relation to chemical usage? I prefer my water temp to be on the high side, somewhere in the high 80's. What do I need to do if I maintain these high temps. Thanks in advance. It's really a good basic question! The main effect of higher water temperatures is to make algae grow faster, if allowed to get a foothold, and to make chlorine react faster. You should keep the Free Chlorine level at 1-3 PPM. As water temperatures rise, more chlorine may be needed to accomplish this. Enjoy the summer! ► Used Well Water - Bad Sulfur Smell And Ugly Color? We just filled our 18,000 gallons above ground pool, with well water. It smells like there is a Sulfur odor and has a really unappealing, murky greenish brown color. We live in the boondocks and don't have city water. I was unable to use our in-home filter system. I was told, because of the volume required. Where do I begin? You should bring in a water sample to a local dealer. He won't be able to test for all that is wrong. From the smell of things, you are going to need some real help. I suggest using a MetalTrap Dual-Cartridge Filter and a small submersible, along with a garden hose to recirculate the water. Keep the pool filter running. The pre-filter should be able to remove the offensive smelling sulfur and other organic contamination. Your well water is obviously of poor quality. You would have been better off having water trucked in, if there was no other option. However, draining the pool could cause the liner to shrink and that would not be good. So let's try and fix what you have. As you recirculate the water through the MetalTrap Dual-Cartridge Filter, it will slowly improve. Run it 24/7, because the flow rate is only 5-7 gallons a minute. Keep the pool filter running 24/7, as well. Get the chemistry right and a free chlorine of 5 PPM and see what it looks like. Adding a dose of a blue Clarifier can help the pool filter remove some of the suspended solids, as they become coagulated, by the clarifier. Watch the filter pressure and clean or backwash wash, as needed. For the long term, a Nano-Stick Clarifier can be hung from the pool ladder and can last 4-6 months. In the future, always use the MetalTrap Dual Cartridge Filter, which removes the sediments, as well as dissolved heavy metals. It features replaceable cartridge and is intended to be a long-term solution, for well water problems. It comes it a variety of connection options, for simple installation. I hope this helps make a difference. ► From Bad To Worse? I just found your site tonight. I hope you can help me. I had rusty stains on my liner and used Ascorbic acid after I tested with Vitamin C tablets in my skimmer. The pool store first gave me a metal remover that did nothing. The ascorbic acid worked great and the water turned rusty red, as the stains left the vinyl liner then went crystal clear then cloudy during the 48 hours the pool place said to run the filter. I told her what happened and she gave me FLOC and it turned it more milky white. She said that I did not let it sit unfiltered long enough, I left it 9 hours. She tested the water and told me to add 4 cups of pH rise and a bag of Bromine shock. To stop the filter, which I did, now it has sat for 18 hours. OH, I did change the DE and wash the fingers, this morning because the pressure kept going up on the gauge and the return was weak the night before when she told me to filter the FLOC for 6 hours after adding. It appeared to clump the DE. It is still milky. I have a children's birthday party this Sunday, today is now Friday. I have been working on this since last Sunday. It a big bowl of chemical soup now. I thought to change the DE and repeat several times if necessary the next two days. What should I do, I am frustrated beyond description. My pool is 4X18 above ground with a propane pool heater (suspect rust entered pool from heater). If you can help me I would really appreciate it, the pool girl just keeps giving me more and more products to try I am starting to think she doesn't know, is guessing. She said to soak the fingers in Vitamin C, when done and a friend said to soak them in muriatic acid. Help what should I do to clear the water, clean the pump? Appreciate any help. Floc is not one of my favorite products. With a DE filter you should almost never need it! Never! To make matters worse, it was not used properly. Is she guessing? I would think that is putting it mildly. Test the pH and raise it to 8.0 or higher ASAP. If you need to raise it, add the chemicals and bypass the filter. Once dispersed, shut off the filter until tomorrow morning. In the meanwhile, clean the filter out and soak the fingers in a muriatic acid solution. I never heard of vitamin C being used for this purpose to clean a filter - it doesn't make sense. An acid soaking will do a better job. Get the filter ready to be used the next day. Tomorrow morning, slowly vacuum the sediment on the pool floor to waste. Take time to get all the precipitate off the floor. Resume normal filtration. If there is still floc present it may cause a rise in pressure, so check periodically. Check the pH and free chlorine levels and adjust as necessary. Filter 24/7 until the water is clear. The heater should not have contributed iron the water - copper perhaps. I suggest that you have the pool and tap water tested for iron and copper. Possibly, your source water is high in metals and that could lead to staining and discoloration. Some chemicals are useful in treating these problems, but they often return. Use the METALTRAP Filter to recirculate the water and you actually be able to remove the metals from the pool water. Use The Metal Trap filter, when adding new water and you'll avoid introducing more problem-causing metals, such as iron, copper and manganese. Good luck. Hopefully, it will all work out. Hello, I hope you can help me with my pool problems. I have a 16x36 inground pool, ( it was here when I moved in) its a fiberglass with a sand filter. O.K. here's what I was doing. I had shocked the pool at 1st with the calcium shock, a no-no if you already have hard water! O.K. these are the results after a water sample was taken to pool place: total chlorine 10, free chlorine 0, pH 7.5, total alkalinity 180, total hardness 401. So after that I put in 7 lbs of stabilizer (cyanuric acid or something) and also 1 quart of scale inhibitor to reduce hardness. Still my test strips show no available chlorine and hardness is still high and water is still cloudy! Help please! Also I've been backwashing sand filter regularly I don't know when sand has been changed lately. Should I attempt to vacuum the bottom even though I can't see it? When I brush it stirs up gunk, that's for sure. Thanks. Adding the stabilizer was the right thing to do, only if it was too low! You never add it because the chlorine level is low. Zero free chlorine probably indicates the presence of algae and wastes. This would account for the cloudy water, as well. You need to add shock - no ca lcium hypochlorite - until the free chlorine level is 5-10 PPM. Add product and retest the water every few hours. Don't drag it out or even more chemicals will be required. Using the right tester is important. I suggest that you use a ColorQ All-Digital Photometer Tester. It eliminates all the color-matching and guesswork. Sand filters are not great at removing dead algae and should not be backwashed regularly - only when the pressure is too high or the filter will lose efficiency. Inasmuch as you don't know when the sand was last changed, I suggest that you replace the sand. Using a zeolite sand filter replacement media, in place of sand, will greatly improve the water quality and make a positive contribution. You'll only need about 1/2 the weight and it is modestly priced. Have the water tested for pH, TA and stabilizer. Adjust as necessary, trying to keep the pH closer to 7.2. The scale product will not lower the reading, but will enable more calcium to remain in solution without causing problems. By lowering the pH closer to 7.2, you should be able to avoid scaling conditions. If in doubt, refer to the page on the Langelier Index and plug in your numbers. By all means, use the pool vacuum. I hope that this advice will prove helpful. ► Grossly Green Pool Water? I am a new pool owner, and just shocked the pool for the first time. Now I'm the one shocked! The pool looked great before, with it's new water. Right after shocking it, a couple of hours ago, the water turned a gross green and my filter cartridge was coated. What could be causing this? Thanks! You can rule out algae, even though there is a problem with green pool water. Shocking doesn't make algae grow. It sounds like a mineral: iron, copper, etc. I suggest that you have the water tested for these metals ASAP! If using well water, this is not an uncommon problem. You will have to add some quality mineral treatment, if the water analysis confirms the problem. Thereafter, if possible, add new water by placing the garden hose in the skimmer and add a phosphate-free mineral treatment, such as Liquid MetalTrap, prior to the addition of the water. Even a better suggestion would be to use a MetalTrap Filter, with the garden hose, to keep all new water heavy metals free. Refer to the archives on iron and copper for additional information. It is important to keep the cartridge clean and maintain good water flow. The Blaster Automatic Filter Cartridge Cleaner makes it easier than ever. I hope that this information will get you back on track. Good luck. ► Trying But Not Succeeding? I am trying to fix my cloudy pool water. I have had it tested twice. My pool is 5,000 gallons. The first test came back that I needed 9 lbs alkalinity, 8 ounces pH, 1 lb shock and 1 pound of chlorine stabilizer. After I followed the instructions and vacuumed the pool after the pump ran for 8 hours the pool was still the same. It is not registering chlorine. I then took another water sample back. The pH and alkalinity are fine, but I cannot get a chlorine reading. They told me to keep running the pump for a few days and it would clear up. Any suggestions? Thanks. All of the chemicals, expect for the shock, that you added were necessary to balance the water chemistry, but will not contribute to chlorine level. Assuming that you have recently opened the pool, it would not be uncommon for there to be algae and an accumulation of debris. A dding 1 pound of shock, is what the label suggests, but it is not always enough. You must continue adding shock, about a pound at a time for your size pool, until the Free Chlorine level is being maintained in the 1-3 PPM and lasts through the night. At that point the water should be clear. A salt chlorine generator is a better way to do chlorine, affording more control and better results. To can use it to dial the free chlorine, up or down, as the needs and seasons change. To help clear the water, try adding a Nano-Stick Clarifier. It lasts for 4-6 months and helps produce better water quality and clarity, while adding contributing nothing to the water. It is the 21st century way to crystal-clear water. It is really a matter of adding enough shock to completely destroy all of the algae and debris and provide an excess to act as a sanitizer. The Nano-Stick will help keep it sparkling, so long as proper sanitizer levels are maintained. Good luck and I hope this information will be helpful. Enjoy the season. ► Scaling And Cloudy Water? My pool is located in a very hard water area and I have some scaling and cloudiness issues. The pool maintenance company has mentioned something called a magnetic conditioner. What is this? Magnetic Water Conditioners are strong permanent magnets that are strapped on the return lines. It is reported that pool water passing through the return lines is subjected to a magnetic field, causing micro-changes in some of the water content. In short, the magnets are said to cause some beneficial changes: reduction and elimination of calcium scale, improvement in sanitizer efficiency and some positive effects on the overall water chemistry and clarity. In very hard water situations this type of product can make a substantial improve in the water quality. No power is required and installation should be a simple. I hope that I have been of assistance. ► Cloudy And Scaled After Vacation? I am new to salt water pools. Have had it since last January 2007. It has run fine and stayed crystal clear until I went on vacation 3 weeks ago. I returned to a slight green pool and a milky looking powder. The cell needed cleaning and pH was off, I cleaned the cell and corrected the pH then shocked the pool. Now the pH is correct, the cell is functioning and the chlorine level is OK. Pool remains milky looking, filter is clean (cartridge type). Have run the pump 24/7 for three days and still milky, but all the powder that was on the flat surfaces is gone. Any ideals what this is. It is building up on the tiles and looks bad. Salt chlorine generators tend to cause the pH to rise. In your absence the pH rose too high and scaling and cloudy water resulted. In the future, drop the pH to 7.2 before leaving for a 2-3 week period. Longer periods will require some attention. See below for insight into the chemistry involved. An easier way to clean the filter cartridge is with The Blaster Automatic Filter Cartridge Cleaner. Try adding a Nano-Stick Clarifier to help eliminate the cloudiness, for as long as 4-6 months. Three factors contribute to scaling conditions: high calcium hardness (usually over 400 PPM), high pH (usually over 7.8) and total alkalinity (usually over 200 PPM). All three together make it even worse. You can lower the pH and TA with acid. The calcium hardness might be controlled, but not necessarily lowered, by adding a calcium sequestering agent. I suggest that you test the water for pH, TA and calcium hardness. Installing The Magnetizer can help control scale-related problems, without chemicals. The Langelier Index will tell you if the water is scale forming and provide insight to help improve the situation. I hope that this information prove helpful. My water seems to be perfectly clear in the morning. After the kids start using the pool, I notice that the water is not as clear as I would like. The pool is big rectangular above ground. I'm not sure about the size. I test the water and can find nothing that needs to be corrected. The next day the pool water is fine and then it get bad all over again. How can I avoid this problem with cloudy pool water? Having a group of kids jumping into the pool and swimming about is apparently stirring up some silt on the bottom. This fine silt is causing the change in the water's appearance. Make sure that the filter is operating during these periods. Filters can't remove silt from the bottom. However, once the swimmers raise the silt, it can be filtered out and the problem will slowly get better. If you don't have an automatic pool cleaner, it is something to consider. It is an especially important, in the case of a large above ground pool. Using a robotic pool cleaner will vacuum the bottom and remove the silt. It is best to do this before the kids jump in. You might try to vacuum more often, again in the morning before the kids stir things up. If you add a circulation booster, you will give the filter more opportunity to remove the silt, by keeping it in suspension. The Pool Circulator, installs easily in the return fittings, and improves circulation by as mush as 1500%. Better circulation helps produce better water quality. Lastly, you should try using a quality "Blue" Clarifier, after the water has been stirred up: these products can help remove fine, suspended particles, by increasing the filter efficiency. Sounds like the kids are enjoying the pool. Have a good summer! ► Floc May Not Be The Answer? I know I’ve seen you say on your website that you really don’t like floc treatments. Can you explain why? I flocked the pool and went out the next morning and I thought it looked great. The water was crystal clear and a lot of the suspended particles were on the bottom of the pool. I vacuumed up as much as I could while wasting the water. I did send some of it through the filter simply because I was losing too much pool water. Thanks for all your help. For me, floc is a last resort product. It does work, but it creates more work that it might be worth. To remove some suspended particles, you create a vast amount of a gelatinous precipitate that falls to the bottom. Wait overnight and vacuum to waste. You throw water and chemicals away and if you get the floc into the filter, it may need to be cleaned. In the end, you may wind up with clear water. However, the problem that lead to the cloudiness may still be present: algae, poor filtration or bad water chemistry. Better to address the problems, of improving filtration, eliminating algae or optimizing the water chemistry, directly. Once done, a recurrence is less likely. Sometimes all that is required is a clarifier or shock treatment or a filter cleaning or a chemical adjustment. A Nano-Stick Clarifier can last 4-6 months and works continuously. It is simply hung from a rail or ladder and contains no harsh chemicals. I hope that this information is helpful. ► Disgusting Black To Cloudy Blue? Hi Alan. What a great idea for a website! A lot of very useful information. I have a question for you. We had a very bad winter with our inground pool and we had a pool company come over and open it for us. It is our first year opening our pool because we bought this house at the beginning of the summer last year and the previous owner opened it for us. Now, we had that black disgusting water and green algae floating all over the top and it smelt like a fishery as they opened it up. The pool responded to the shock treatment very well right away. You could see it changing color immediately, which I thought was good. Today, 24 hours later it is still a cloudy blue. How long will this take to clear the water? Not that its warm enough to swim or will be for another month, but just wondering how long to wait. The filter is running continuously and the circulation is great. They used a correction kit along with an opening kit. So, will the water eventually clear itself up or should we give it a few days then add something? Thank you. You are definitely making progress, but a little help might be in order. Test the Free Chlorine and try to keep it in the 1-3 PPM. If n ecessary, add more shock. All that algae can require a lot of chlorine. Adjust the pH to 7.2-7.6. Some filters are better than others at removing dead algae and fine particles. You might want to add a Nano-Stick Clarifier. It works to destroy organic byproducts and wastes, that detract from optimum water clarity The improvement could be quick and dramatic. If you have a sand filter, this might be a good time to replace the sand and start off with a clean page. Even better would be replacing the sand with zeolite: a replacement media for sand filters. It will produce much better results than ordinary sand, removing even the finest of particles.. Make sure that you thoroughly vacuum the bottom, otherwise, when the pool is used, the silt on the bottom might cloud up the water. If you don't have an automatic vacuum, give it some thought. Robotic Pool Cleaners do a great job and will micro-filter the water and they travel the pool. I hope this information will help you get off on the right track. Enjoy the season. ► Soda Ash Causes A Cloud? I am a service technician in southwest Pennsylvania and my problem is that sometimes when I add soda ash to pools to increase the pH the water turns really cloudy and murky. I was wondering if you could shed some light on maybe why it happens, if there is a way to combat the cloudiness. If the chlorine is on the higher side about 5ppm would this have something to do with this problem? I don’t remember this problem happening the past several years. If you have any ideas I would like to hear them. Thanks. Most likely the cause is high calcium hardness - something in the area of at least 300-400 PPM. As the soda ash dissolves, it creates an area of a very high pH, surrounding the chemical. This, in turn, decreases the solubility of calcium and can create a cloud of calcium carbonate. If the soda ash can be added slower and over a greater area with circulating water, it is less likely to happen. Refer to the Langelier-Ryznar Index page for some insight into the relationship of pH, TA and calcium hardness, as it affects scaling conditions or cloudy water: It has nothing to do with the brand of chemical, although use of calcium hypochlorite should be avoided. I hope that this information will prove to be useful. ► Can Acid Cloud Water? When the free chlorine level is excessive (by adding too much), will the addition of acid (to balance pH) make the water cloudy? Not likely! Lowering the pH makes the chlorine more effective and minerals more soluble. If the pool water clouded up, it might be because the more effective chlorine killed algae present on the walls. Don't leave the water acidic, as that will cause corrosion and possible bather discomfort. I hope this information will clear things up.